Orange or Clouded Sulphur - Colias sp. I have seen a caterpillar in my hedge.It is light green in colour,with dark brown/red and white diagonal lines on the top.It has a barbon top of its tail.It is about 2.5"long & about 1/2 to 3/4" thick.Any ideas what this might be? I can't find my caterpillar, I found it outside my house on my trampoline. I believe it apparently fell out of the tree looking for a place to build its cocoon. But my caterpillars are small and the ones that are bigger, aren't even close to the size of my finger. They have this beautiful autumn color, lime green, orange and red. They aren't spiky or really furry. Help please bcuz I have so many and I have no idea what to give them. I amthe person who commented before it under this one I saved of from ants trying to eat it! I found this caterpillar that is a dark brown and has black and orange eyes with white stripes down its back. Help?? 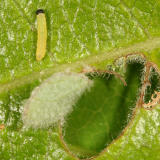 What is the name of da gold,blue,black and white caterpillar??? im researching??? I found a weird caterpillar that's super skinny less than an inch wide and at least three in. wide. it has two off-white stripes down its sides. what is it? It doesn't appear that anyone is answering questions... unfortunately I have one of my own. I found a caterpillar last night. It's a little thinner a pencil... over an inch, closer to two. It's ringed from end to end in two colors... grey and an off-white or very very pale yellow. I looked thru all the moth caterpillar pics and now I'm going thru butterflies. No luck so far. And I'm in SE Texas. Oh... and I found another one this morning but it appears to be dead. We've been having LOTS of rain. I've never seen one like this before. please let me know I will always be on the website I mean ALWAYS!!!!!!!!!!!!! We have a tiger moth caterpillar that went into it's cocoon, but now the caterpillar's cocoon had now these deep red hard spots. What would they be? I found a green caterpillar with a hairy fern like upper covering... and I couldn't find its image in your gallery. I can provide its picture if you want. Please help me know its biological name. I can't seem to find what type of caterpillar this is; it is a small, smooth, light green one with a white stripe on its side. Does anyone have any idea what this could be? I found a large green, nearly hairless, caterpillar on the sidewalk the other day, but cannot seem to identify it. I can provide a picture to anyone who is interested. hi I have a lime green caterpillar with a long black stripe going down it's back with a little bit of yellow along the black,it has a large black head and super suction cups underneath any idea of what this is?? Lovely site, very helpful for ID'ing species. Thanks a lot. I found a large, hairless, purple caterpillar with pink spots and outlines and cannot determine what it is! I have a photograph as well and would like to post it. Thank you. I found a caterpillar that is all black and has two long, yellow stripes going down its back. I can't find what it is help!!!!!! Btw it was eating my stevia plant when I found it. I need your help identifying a caterpillar. It has two vertical yellow, red, and black stripes down its back, yellow and black spots on the sides, a slightly curved red horn on its tail, yellow legs, and it is very, very green. I know that it isn't a hornworm b/c it doesn't have diagonal stripes. Thanks, E.L.
A picture is easier to identify than a description and a location helps too. I found a brown caterpillar and if you search brown caterpillars that's what it looks like but I don't know what it is or what it eats. HELP I love caterpillars and I want it to live!!!!!!! i dont see mine its sort of scaly? they don't move much! they just want to lay around! I have this little hairless light brown that I found on some milkweed, in Ontario, Canada. He has 2 darker stripes near his head, and 1 by his rear. I can't find out what he is. Does anyone know? I just found this caterpillar and it appears to be fairly aggressive. I have never seen one like this before. Anyone know what kind it is? I have found three pretty big pink caterpillars in my house. THey had racing strips (that is the best description that my son and I could think of) on the sides of their body and a eye like thing on their back. Does anyone know what they are? So does anyone know what kind of butterfly the brown smooth caterpillar with a few round tan circles on it's back, will become? they are eating fennel. Mine looks like the Crimson patch but instead of black it was brown and smoother. I have some caterpillars eating the fennel in my back yard. they are black with diamonds on their back. What kind of butterfly will they become? I found a tiny black caterpillar in my backyard in mobile, alabama. It has yellow and seemingly dusty blue stripes on it's side that go lengthwise and seems to have a small fuzzy band behind its head. I didn't see a pic of it here and I want to know what it is. The little is less than an inch long. you have a great site here just wish you had more pictures. I have photos that I took in my garden and cannot find what they are. I found another site at butterflies and moths.org and found 3 of the ones I wanted but have 3 more unidentified. thank you for haveing such professioal and clear photos and identification. We're desperate to identify our new housemate! I've searched every site - no luck :-( It's a lovely green with black dashes going the length of it's body, each side of it's back. It was found eating a gourd left in the garden 2 days ago, and it happily eats apples now in captivity. It's not quite an inch long, but very thick! We're in Boise, Idaho. My 8yo son and I would sure like to know it's species. It's been a wonderful houseguest! Thank you for your lovely site!!! Have also fond same as Debbie but on a viburnum in East Anglia Uk. Any ideas? What a wonderful site and resource -- great pictures that capture important distinguishing detail. Thank you! Your pictures are great. If you were to post a picture of the butterfly next to the caterpillar picture it would sure help (at least me) in identifing which caterpillar goes with which butterfly in my garden. Thanks for posting these pictures. I am going to show my grandson. 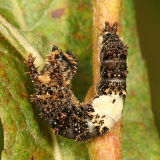 We have just found a caterpillar on a Bhudlia bush - lime green, as thick as an adult finger,approx 2 inches long, light purple & white slash style markings on side of body with yellow dots at base of each slash and a yellow/cream horn with a black outline & tip on the back end. Does anyone know what this is please? I just found a light brown caterpillar with silver stripes on its sides and one eye. Never seen one like this before, very interesting. I found a caterpillar of monarch ,hanging under a milkweed leaf, but it seemed dead. I was sad not to see that change into chyrsalis? This is an amazing and valuable site - thank you for sharing. found a large white caterpillar with a brown head & feet that rolled out of a log in nj. any clue?? i live in New Hampshire and on a Hibiscus leaf I saw a caterpillar with red looking eyes, two black antennae, yellow bulbs on it's upper back, wide white furry hair that tappers down about halfway down it's back and becomes very white with a black stripe down the middle and it has a brown tail with a black tip. Very interesting caterpillar. If someone can help me ID it that would be great. i found a green caterpillar that is tiny and has brown marks on it! can someone please tell me what kind it is??? I live in Greenville south carolina and I have found a purple caterpillar that has pink like spots or marks. I was shocked at first but now im just wondering what it is! Please let me know about any information and I also have a picture. Thanks. I think I found an eastern tiger swallow but it isn't green it's kinda reddish brown but has the same eyes and mouth look on its head. Is it the same catapillar? I found a weird looking worm yesterday and thought I'd check online and ran across this site. Don't see it on here. It was kinda tannish-white with a black line running down it's back and it had a cute little round head with a face and would rare up ever once in a while and look around. Maybe an inch-and-a-half to two inches long. Any clue? My daughters and I found a semi-hairy gray caterpillar with red and yellow spots, black tail, and red feet. Can anyone tell me what kind it is so I can get the right plants for it to feed on? great job but i can not find mine could it be a silkworm or moth..
i saw one with awesome light yellow and green spiky hair, what kind are those? i couldn't find my 1....it's black with orange line in the middle. i found this catterpillar that sticks out these red horns what type of catterpillar is it? 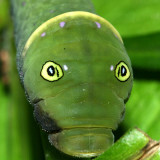 Photographed a caterpillar approx. two inches long. It was bright red/orange with a black stripe running down the center of its body, full length. It also had ten bright yellow spikes of hair, four at the head, two mid body, and four on its rear. Any idea what it might be? Rather big green wide catterpillar as big as tamato worm but with small red,blue,and yellow spikes in a pattern over body. it was aprocimentally as big as your index finger and a baby green color. please post picture. I could not find "my caterpillar" in your gallery. The one that I found on a busy city sidewalk is a yellow long-haired caterpillar. It looks like it is shedding. Can you tell me it's type and what does it eat. If it survives, what will it look like in it's next stage. 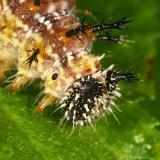 Know what name this caterpillar is? i found a caterpillar with with dots on it's back and black other wise. i found them in there nest. about 100 of them. can you please tell me what kind they r? I found a caterpillar that is sort of a brownish gray, it has black and white dots down its sides and one long white stripe down its back. In the light it looks like it has a little bit of orange i there too. PLEASE TELL WHAT KIND IT IS. I have found a some what long caterpillar, its green with nothing else it looks like the european skipper, AND like the arctic skipper...i cant really help it if i dont know what it is, i found it in a spider web. PLEASE EMAIL ME OR COMMENT BACK AS SOON AS POSIBLE !! I found a caterpillar thats light green with a light brown strip down its back and its head is brown i really need to know what kind it is!!! I have a driveway full of black hairy one must be ten or fifteen of them ,how long before the are gone ? I am on a hill top in Douglasville Ga. 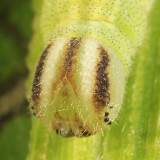 I have shiny black caterpillars with white bands, red heads, red tails, eating narcissus leaves, in Louisiana in April. What are they? I found a dull colored fat one. I have yellow catarpillars all over my house, driveway, and everything, I have a large tree that hangs over my house, what are they and how can I get rid of them, there are thousands of them, they have 3 or 4 bumps on their backs. I found a caterpillar that has a red head, a yellowish greenish slimey body that looks like it has little eyes all over it. Hi Tom ! I have found a totally orange fluffy caterpillar in our flowerbed and would really like to know more about it. I have a green caterpillar with a yellow stripe along it's sides, three anntennae, two on it's head one on its's abdomen, a red head, and it's fuzzy. Please, help me!!! I saw a huge caterpillar today on a tomato vine. It was about 2 inches long, had tiny red dots in a couple spots and had a red spike tail about 3 cm. long. 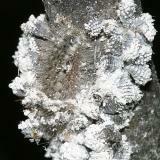 The strange thing I saw on it was a bunch of white things it had on its back that looked like rice. I thought they were eggs, but somebody told me that caterpillars didn't lay eggs. I took a picture with my cell phone. I wish I could download it to show you but I cannot. What kind of caterpillar was this? Haven't seen many monarchs this summer and have read that a winter storm in Mexico was fatal to many wintering monarchs. 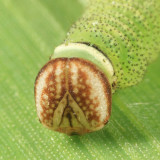 I live and teach in the Middlebury, Vermont, area and am looking for a caterpillar to use in my classroom. Anyone have any tips? i've got a caterpillar that is lime green, a line on the centre of its back. i duno wad kind of caterpillars is it. hw to find out? I can not find what kind of butterfly these caterpillars are in my garden. They are huge. Like a lime green no hair like dots vertical all around them that have bron on each side of the dots and yellow in the middle of the dots. SOMEONE HELP?????? I can hardly wait until my grandsons wake up in the morning to show them your site. Your images are outstanding. We looked at several websites for a caterpillar that we found at our cottage. Yours was the most organized. However, we couldn't find our beautiful caterpillar here. It has a grey green body with intricate pink patterns on its back with two elongated pink dots in its second last segment. The head is a darker colour. 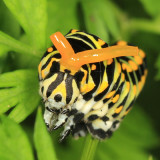 If anyone here recognizes this caterpillar, please email me at: joanrose@hotmail.com. i have just found loads of black and gold striped caterpillars on a ragwort plant, what type are they? Those are really great pictures-- however I still need help identifying what is using my ostrich ferns as a host plant. The ends of the fern fronds are rolled up and inside there is a small green caterpillar. I also found a pupa--it was small and red. Can you help me with ID? You have the best photographs I have found. Wonderful resource! I photographed a large grey caterpiller. He had a patterned back and 2 rings across his front section that puffed up red when he was disturbed. I can send picture. He looked fierce. do butterflies and caterpillars intereact in any way? 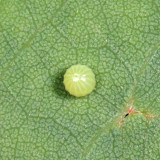 Wow, just great photos, but alias I did not find the one that is in my garden. But the ones with the big eyes/markings are going to be in my nightmares for a long time. Nature is sometimes a little scary! Thanks for your great pics. They helped me ID the nine huge Black Swallowtail caterpillars decimating my bronze fennel. Wonder where they will spend the winter. I have identified from another web-site (the name of which I've lost) a LAELIA COENOSA (Red Tussock).Can you tell me where this caterpillar comes from and what it produces. Its habitat is in my wall baskets feasting on mainly trailing geraniums but has also decimated an astilbe plant. Great photos Tom! I found an interesting caterpillar crawling in the park. I took it home but couldn't identify it over the net. (I hadn't seen your site.) I put it in a jar hoping it would pupate so I could find out what it was. It was a red spotted purple. I just released it! Thank you so much for your site. Most others go by the butterfly name, but if you don't know what kind of caterpillar you have found, then you can't look it up by name. This is wonderful. Thank you so much. Hello Tom, thanks for all your work from an educator. I just found caterpillars all over my azelea in the back yard. The are the same but not on this list or your moth list. They are two to two and one half inches,body is black with white dash like marks, and head and feet are maroon. They are artistic and atractive creatures-the heads are distictive parts and so are the feet, or whatever you call them. Do you know what this is? (I just corrected my errors! Sorry!) I am in Mobile Alabama. Beautiful collection, but I did not find mine. My Granddaughter found our caterpillar on my Meyer Lemon plant. It is varying shades of gray and has a head like a viper snake (very ugly). When bothered it raised dark orange antennae. We put it in a jar and it is now in it's chrysallis stage. We live just north of Houston, have any ideas what ours might be? The Viceroy is almost the same as the Red-spotted Purple, except for the length and thickness of the antennae and the size of the bumps on it's back. The Monarch was a very late season caterpillar in Vermont, and sometimes they'll get dark markings like that one to absorb more warmth from the sun. Plus in Vermont there's nothing else it could be. You have a few miss noted. Check out the Viceroy Caterpillar for reference and one of your Monarch identifications about 2/3 down on the right looks to be another type with its heavy black markings. Your pictures are wonderful yet I still cannot seem to find my catapiller amoung them. It is a fluffy black with orange stripes on the sides. Where it is orange so is the hair. The back is black. There is a little yellow poting with the orange striping. I found it in my back yard. I live in the high desert in Southern California. Maybe I have a moth I just do not know. I was thrilled to find your excellent collection of photos. I love butterflies and have in the past two seasons raised swallowtails, gulf and variegated fritillary, monarch, and buckeye butterflies. Thanks for the help. My boys and I found a catterpillar in the garden and put it in a jar. It has now turned into a pupa. I wanted to know a little about what it was or would be. Thanks again the pictures helped a ton.